Case B9. Complete Heart Block – Broad QRS Complex Escape Rhythm. St Emlyn’s ECG Library. The ECG was recorded from an 84 year old man who was usually fit for his age. He was found pale, short of breath and very confused. His GP noted that his pulse was 30 per minute and this ECG was recorded on his arrival at hospital. The ECG shows P waves at a rate of 95 per minute. There are QRS complexes at a rate of 47 per minute. There is no relationship between the P waves and the QRS complexes: complete heart block is present. Morphology: The QRS complexes are broad (greater than .10 seconds). There is a secondary R’ wave in lead VI and deep S waves are seen in the lateral precordial leads V4, V5 and V6. T wave inversion is present in leads VI – V3 and in leads I, aVL and V4 and V5. The appearances resemble right bundle branch block (RBBB). The ECG shows complete heart block with a broad complex escape rhythm. The rhythm is probably arising from the ventricle although it is not possible to say this with absolute certainty from the surface ECG. The rhythm could be arising from the AV junction and be conducted with RBBB or alternately it could be arising from lower down the conducting system in the left bundle or Purkinje system. As a general rule the higher the site of the pacemaker responsible for an escape rhythm, the faster will be the rate. Pacemakers in the region of the AV junction usually have a rate of approximately 40-50 per minute, while an escape focus in ventricular myocardium will be slower: 20 – 30 per minute. However the overlap that occurs does not allow the rate alone to be used as a reliable indication of the pacemaker site. Broad and bizarre QRS complexes may occur when the escape rhythm is of ventricular origin. The ECG shows one other point of interest. One would expect that in complete heart block the P wave would be entirely regular or might show sinus arrhythmia. Careful inspection of the rhythm strip shows that this is not the case; the P – P intervals that contain a QRS complex are shorter than the P – P intervals that do not. 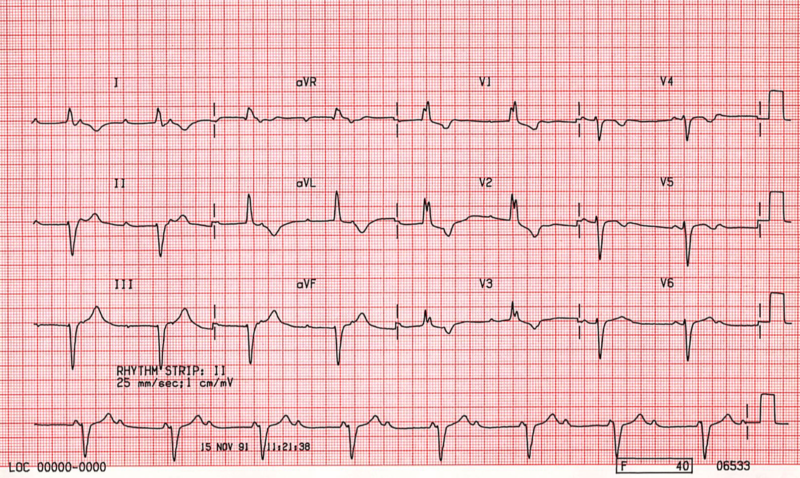 This phenomenon is known as ventriculo phasic sinus arrhythmia and is seen in this case. The mechanism underlying this is not well understood.